In January, YHA CEO Caroline White addressed an audience of more than 100 key decision-makers from the local community as well as business and tourism representatives as the final design of The Sill was unveiled. The Sill is the brand new Landscape Discovery Centre and Youth Hostel which is situated at the YHA Once Brewed site on Hadrian’s Wall. Caroline spoke about why YHA are involved in The Sill project and why the project ties in so well with YHA’s mission to inspire one million young people. YHA has long been a place where people living in urban areas can reconnect with the countryside and get back to nature. YHA and the Northumberland National Park both inspire future generations to conserve and protect the unique and rare landscapes that we are lucky to have in the British Isles and are determined to make the countryside matter to young people. The YHA facilities will be safe, fully accessible and super modern, providing the kind of experiences that young people expect. 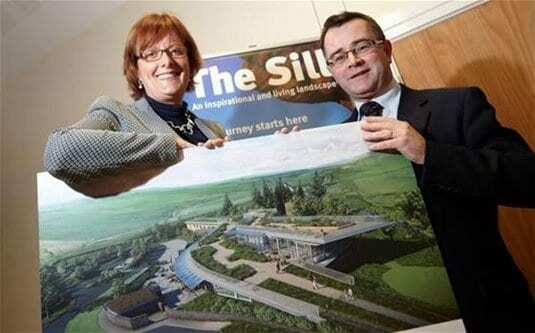 The Sill will provide a building that will revolutionise learning experiences outside of the classroom. The Sill has already been helping young people by offering an extensive learning and participation programme, school visits and workshops, academic fieldwork and new outdoor learning experiences. The finalised designs will now be taken into the planning phase. If the planning application and is a success and the funding for the project can be found, the building of the site is scheduled to begin in 2016 with the centre opening its doors to the public in 2017. The stunning and fully accessible grassland roof will form the centrepiece for the new centre. This will be created out of the rare whin vegetation which is native to the Northumberland National Park. The project aims to connect people to the landscape of the Northumberland National Park and will become a hub for learning and innovation, not just in the park but further afield as well.